134 years ago, the Canadian Government introduced legislation to ban the P’a_sa, or Potlach, in an attempt to disassemble the culture of Indigenous peoples in Canada. An exhibit at the Comox Valley Art Gallery aims to educate the public about this section of Canadian history, and the impact that continues to reverberate today. The Comox Valley is a beautiful place to live, full of libraries, banks, churches and schools, farms, a court of law, and three municipalities that are working for our best interests. We are free to be ourselves and to work together as a community. Now imagine, if you will, people coming into the Comox Valley and burning down our banks, churches, schools, court of law and municipal offices. Imagine the pandemonium, the starvation, the grief, the confusion, the loss, and the trauma. Imagine not being able to hire a lawyer to defend yourself because you’re not considered a citizen of your land. This is what happened to Indigenous peoples when the Government of Canada outlawed the P´a-sa or Potlatch, the Powwow, and the Sundance. A Potlatch is not simply singing and dancing around a fire. A Potlatch is where a Chief takes care of his community by giving away food and clothing. It’s where we tell accounts of our history and connect it through generations. A Potlatch is our banking system and our judicial system. A Potlatch is where we give names and acknowledge family ties. It’s where we collectively acknowledge our present and remember our history. It’s where we conduct marriages, remember those who have passed on, and negotiate territory lines. 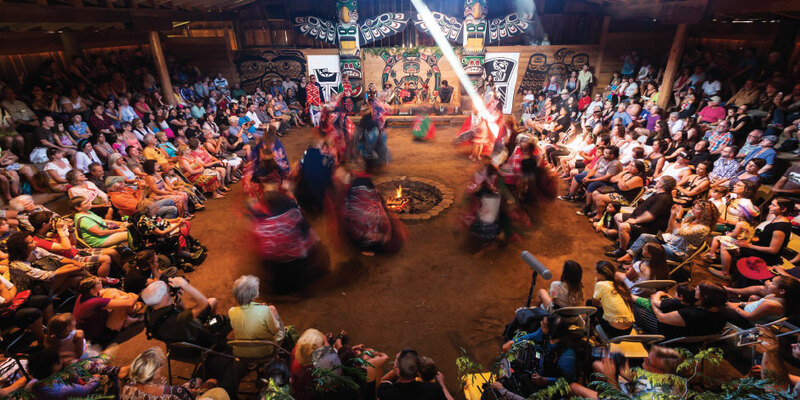 A Potlatch is so much more than singing and dancing. In 1884 the Government of Canada introduced legislation that would make the P´a-sa or Potlatch, the Powwow, and the Sundance illegal, stating that “Every Indian or other person who engages in or assists in celebrating the Indian festival known as the ‘potlatch’ or in the Indian dance ‘Tamananawas’ is guilty of a misdemeanor, and shall be liable to imprisonment…” For 67 years, Indigenous peoples were not allowed to practice the system that is at the very core of who we are. Although outlawed, the process of prohibiting the Potlatch took time. A decade later, government officials were still working to shut down the potlatch system. “…[C]elebrating the potlatch is a misdemeanor. This Indian festival is debauchery of the worst kind, and the departmental officers and all clergymen unite in affirming that it is absolutely necessary to put this practice down.” (John A. Macdonald, 1894.) Despite great personal risk to themselves and their families, Chiefs potlatched in secret. They felt it was imperative to continue the social, economical, and spiritual system that has been in place for thousands of years. A number of potlatches and feasts took place in secret—in basements, living rooms, and isolated locations far from town. One potlatch was held in Y´alis (Alert Bay) by Chief Dan Cranmer. This potlatch remains well known today, not only because of the size of the potlatch, but because the Indian Agent (functioning like a government hall monitor) found out about the potlatch, and 45 people were arrested. Of those 45, 22 were given suspended sentences, 3 were remanded for appeal, and 20 were sent to Oakalla Prison just outside of Vancouver. 600 pieces of regalia were illegally seized by Indian Agent William Halliday with a token compensation of $1,485. In a further act of degradation, the regalia was photographed (sometimes with the Chiefs wearing the regalia) and shipped south on an open barge to end up in private collections and museums around the world. This was not an isolated event. These practices took place for 67 long and painful years. Traditional bighouses fell into disrepair. 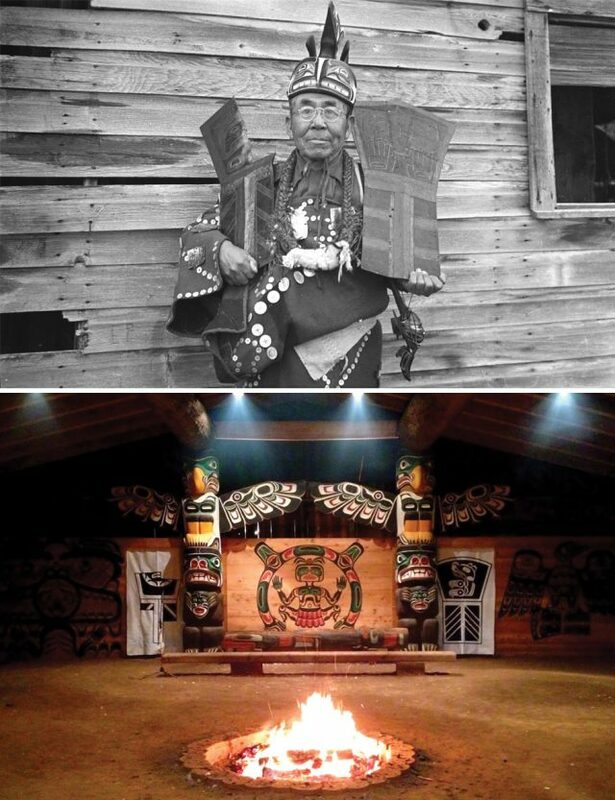 Before long there were almost no bighouses left in Kwakwaka’wakw territory. Locally, the Potlatch Ban combined with the effects of residential schools, fighting between nations, disease like tuberculosis and Spanish influenza, and colonization in general to impact the continuation of our legends, language, and traditional practices in an extremely negative way. The impacts on who our Indigenous people are today, as well as what and how we practice, is unfathomable. When the Ban was deleted—not repealed, deleted—from Canadian law in 1951, a bighouse was built in Victoria by hereditary Chief Mungo Martin. Later, the same plans were used to build Kumugwe, the bighouse now located at K’omoks, in 1959 by Hereditary Kwaguł and K’omoks, and Elected K’omoks Chief Andy Frank. Because of the work of Chiefs and community members like Chief Andy Frank, who was the first Chief to start petitioning the government for the return of illegally seized ceremonial items like those from the Cranmer Potlatch of 1921, ceremonial items have been repatriated back to their families and communities through places like the U’mista Cultural Centre and the Nuyumbalees Cultural Centre. Today, potlatches and feasts happen up and down the coast almost every month. Children are being named, traditional weddings are being conducted, loved ones are being remembered, families are sharing their history and passing down rights and names, and our cultural system is being maintained and cultivated. When we consider all the history that led us to this point, it is awe-inspiring that the richness of the P´a-sa has continued to survive, grow, and thrive today. It speaks to the dedication and resilience of our ancestors, who persevered so that the next generation could grow up with awareness of who they are and where they come from. The Potlatch Ban – Then and Now came to life. The thematic program on the whole includes the art exhibition Hiłt´sist´a’a-m (the copper will be fixed), film screenings, informative healing workshops, community engagement through traditional ceremony and knowledge-sharing, documentation practices, and more. Hiłt´sist´a’a-m includes over 13 Indigenous artists, and opens at the Comox Valley Art Gallery on July 20. It will remain open until October 4, so school groups may attend in the 2018/2019 school year. The film screening takes place on July 5 at the Sid Williams Theatre.